Brona McVittie | The Goose Is Out! 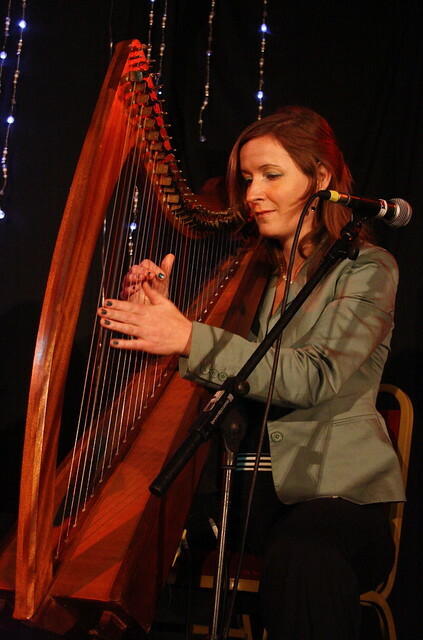 Brona supported Dave Swarbrick at DHFC and more recently supported Ewan McLennan at The Ivy House. County Down singer and harper, she was brought up in Rostrevor, where the mountains of Mourne sweep down to the sea. She is the founder of Rún, a London-based group which evolved out of Brona’s interest in old Celtic songs and the folklore of her homeland. With a Diploma in Musical Techniques and Composition from London’s Birkbeck, Brona creates close harmony arrangements of what would traditionally be performed ‘Sean nós’ (the old way). Brona is also singer and harper for The London Lasses and Pete Quinn, and more recently Legend. She has twice appeared at the Goose in a previous incarnation with Tanya Jackson as The Woodlarks and we are always delighted to have her perform a rare solo gig for the Goose! Click here to go to Brona McVittie’s website!